The name of Lakeman is a common one in folk circles. Brothers Seth, Sam and Sean have long become a byword for reliably high class and innovative music, be it individually or in collaboration with other high-class musicians. So it is with album number nine for Seth who follows up his understated Americana-style previous album with a return to a band led folk-rock approach. Seth has put together a four-piece band, seeking to give the album a fuller, more rocking and up-tempo sound. The unequivocal peak of this ambition is realised with ‘Divided We Fall,’ a blisteringly fast-paced piece of musical marvel with rousing chorus and, in an album full to the brim with evidence of Seth’s talent with a fiddle in his hand, here it reaches breathtaking levels. This is going to be an absolute belter in his live shows. For the equivalent highlight lyrically then look no further than ‘Dig New Ground.’ In a rare foray into politics, Seth delivers a war cry for workers with a wonderfully cutting piece of songwriting that demands the listener’s full attention right up to the climatically cynical lyrical twist. It is another high class, up-tempo song on an album that is not short of them. One of the great things about being a Lakeman must be the wealth of musical talent available close to home to lend a hand from time to time. Here for example brother Sean features on Hammond organ on the aforementioned ‘Dig New Ground’ and, most memorably, sister-in-law Kathryn Roberts adds her vocals to a number of songs. So distinct are her vocals that on tracks such as ‘She Never Blamed Him’ and ‘Lend a Hand’ her backing feels much more akin to a duet, such is the sublime contribution she brings to these songs. That there are also slower, more mournful tracks to be found here simply allows Seth to demonstrate the range for which his fans will no doubt already be familiar. 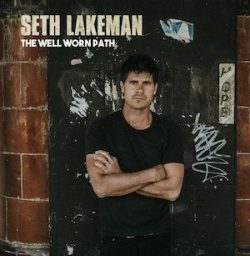 For new admirers ‘The Well Worn Path’ will be a worthy entry into the world of Lakeman. He's a Lakeman. It's good. Obviously.